Hey beauties! Welcome back to Review Wednesday! 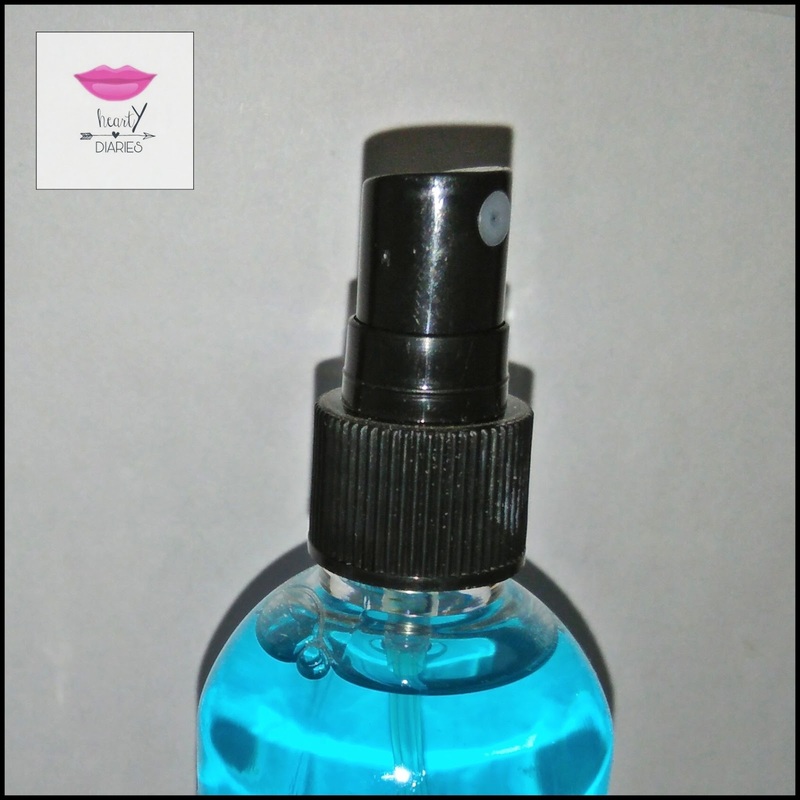 Today I am sharing my review about the body mist that I received in my Glam Ego Box.. 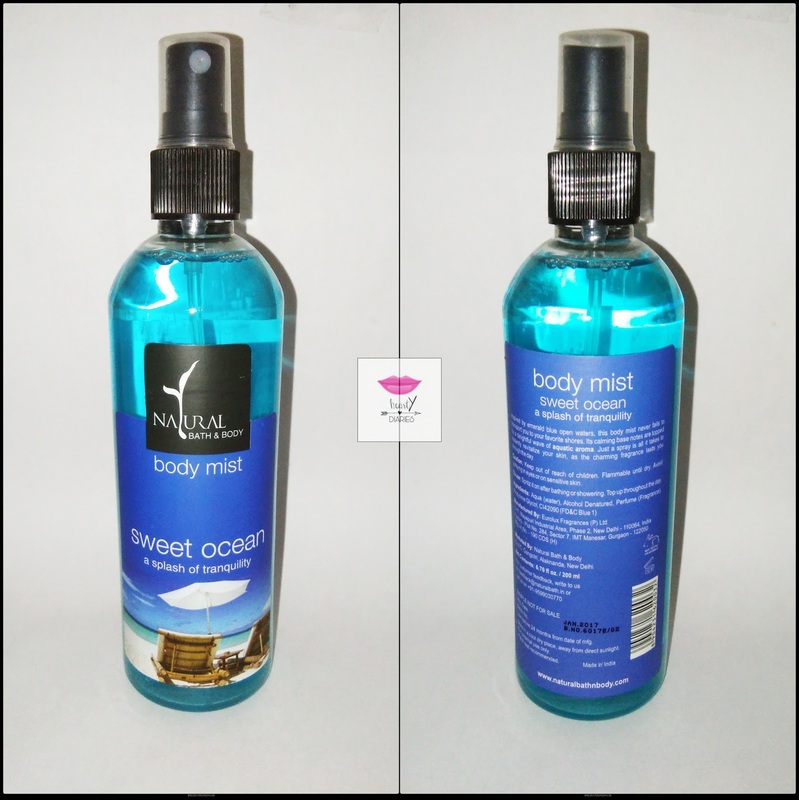 It is Natural Bath & Body Sweet Ocean Body Mist which claims to have a splash of tranquility in it. It is a Paraben Free, Sulfate Free and Petrolatum Free body mist with no harsh chemicals and no harmful colorants. Before heading on to the product description, I would suggest you all to visit Lulu’s Life, my friend Linda’s blog. She is a sweetheart with a lot of talent! Check her blog to read some amazing product reviews, see makeup tutorials and more. Okay lets head back to the product description and details.. Inspired by emerald blue open waters, this Body Mist never fails to transport you to your favorite shores. Its calming base notes are topped by a delightful wave of Aquatic aroma. Just a spray is all it takes to instantly revitalize your skin, as the charming fragrance lasts you through the day. Keep out of reach of children. Flammable until dry. Avoid spraying in eyes or on sensitive skin. The packaging of this mist is quite similar to all usual perfume bottles which have a spritzing pump but it is leak proof, sturdy and travel friendly which I love. Cost: Rs. 325.00 for 200 ml or 6.76 fl oz. This was the best product I got in my GlamEgo Subscription box. I literally fell in love with the scent. It is something different, something I’ve never smelled before. The fragrance is really mild yet fresh. The best part about this body mist is that it is very safe for our skin and can be applied on a daily basis as well. I’ve also read some reviews where people complaint that its smell lasts only for 2-3 hours. I don’t feel the same way. The smell decreases after 30-40 minutes but how would it last for more than 2-3 hours? It is a body mist, not a perfume right? The basic difference between the two is that mists last ideally about 1-2 hours while perfume lasts for 4-6 hours. And if you think the smell is not long lasting, why worry? Spritz it again! After all it is providing a lot of protection to your skin. If it had harsh chemicals in it, it would also have had a smell that lasted for 6-8 hours. My overall experience with this product is great and I love it. Rather than buying strong scented and harmfully chemicalised body fragrances, I would definitely opt this one. Yes. Definitely. Go ahead and try this one out. You would love the smell! Is it worth the money and affordable? Generally body mists are a little more expensive than perfumes but as long as I really like the quality of a product, I don’t mind its cost. For me, this mist is highly affordable because I would love to invest in it again. It is worth each of your penny for sure. Who wouldn’t want to smell great all day without being harmed by chemicals? Thanks for sharing about this wonderful product! Your reviews really helps in trying out the new products.. Awesome post! Thanks so much for the shout out! Hope you enjoyed my latest post! ?? Thanks a lot… Stay in touch.. I'll just go and check it. Was little busy!